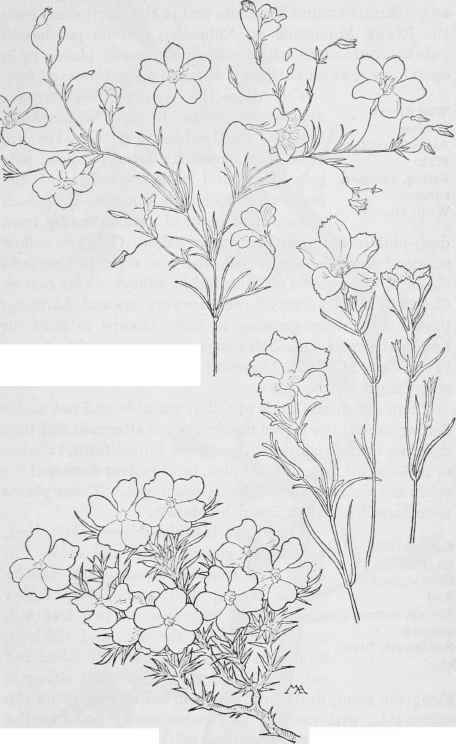 This section is from the book "Field Book Of Western Wild Flowers", by Margaret Armstrong. Also available from Amazon: Field Book Of Western Wild Flowers. A charming little plant, with woody stems a few inches tall and partly creeping along the ground, densely crowded with numerous needle-like leaves, forming dull green, cushion-like mats, sometimes over a foot across and suggesting some sort of prickly moss. These prickly cushions are sprinkled thickly all over with pretty lilac flowers and the effect is most attractive. The flowers vary in tint from white to pink and purple and are nearly three-quarters of an inch across and slightly sweet-scented. The tube is longer than the hairy calyx, and the petals fold back in fading. This grows on gravelly slopes and summits around Yosemite and in the Northwest, from the Rocky Mountains to Nebraska, and its patches of pale color are often conspicuous in dry rocky places, or in open forests, at an altitude of three to seven thousand feet. Linanthus liniflorus. Alpine Phlox Phlox Doucjlasii Ground Pink-Linanthus dianthiflorus. PHLOX FAMILY. Polemoniaceae.